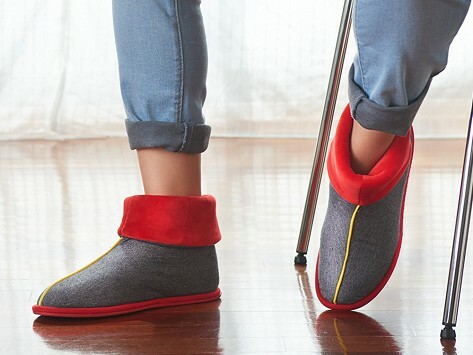 Microfleece lining and memory foam insoles make these booties ultra-comfortable and cozy. Think of them as casual, in-between shoes that look pulled together but feel relaxed. They move easily between indoors and outside, thanks to flexible rubber soles. Wear them to keep your toes warm while at home, or pull them on to run out for quick errands. Dimensions: Small: 9.75" x 3.5" x 4.5"; Medium: 10.5" x 3.75" x 5"; Large: 11.25" x 4" x 5.5"; Extra Large: 12" x 4.25" x 6"
I love these slippers, especially for cooler temperatures, as they are quite warm. my wife loves these Booties. she says they're comfortable and she likes the light weight. bought them for travel, tried them on and did not want to take them off. Comfy, and attractive with indoor/outdoor sole. élé INSIDERS are a whole new footwear category—slip-on shoes that are casual, comfy, and can be worn just about anywhere. They’re durably made with soft jersey lining and memory foam insoles that conform to your feet but regain their shape when you take them off. It’s a detail that’s got purpose, helping these anywhere shoes last longer and maintain their structure, too. The flexible rubber soles add support while the bright colors feature contrasting piping and accents—giving them a cheerful vibe. Founder Jonathan Newman created élé INSIDERS based on popular house shoes he saw in Argentina. Think of them as casual, in-between shoes that still look pulled together. They are comfortable enough to wear around the house, and sophisticated enough to wear out and about. Just be sure to keep them out of the rain or snow. Whether you’re putting your feet up or running errands, INSIDERS make whatever you’re doing comfortable.